Learn how to turn transactional channel partners into Revenue Producing Channel Partners. 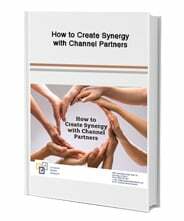 Take a look through this informative eBook for “How to Create Synergy with Channel Partners” by filling out the form on the right. “By the last month of the quarter, our sales pipeline had grown tremendously and we experienced a sales spike of over $10 million – an excellent return on our investment in CMR. More partners were signing on to the system every day and our revenue growth was accelerating nicely.